Pets are great, but sometimes their smell is not. 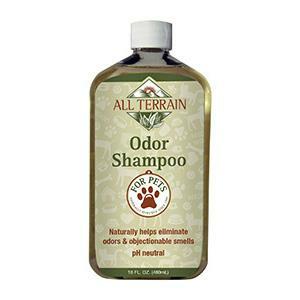 Biodegradable and concentrated, All Terrain’s Odor Shampoo helps eliminate odors and objectionable smells from pets, naturally. - Removes odors such as skunk, chemicals, food, etc. Directions: Wet the coat completely with warm water. Apply shampoo gently, work back to the tail. Lather well into coat. Avoid eyes and ears. Rinse thoroughly and towel dry. Follow up with a snuggle!